While that might've been the case before, the expression "The Kitchen is the Heart of the Home" has never been more true than in today's homes. 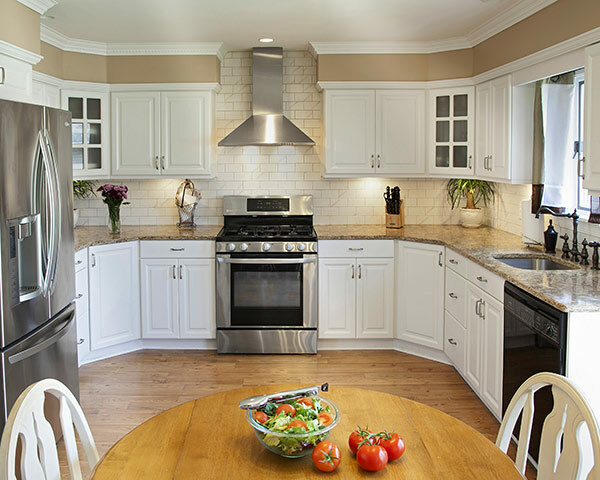 Kitchen cabinet designs are a primary kitchen design element. The kitchen used to be a separate room, hidden from guests. Now, kitchens are an integral part of an open floor-plan and customers care more than ever about what their kitchens say about them. That's right, your kitchen cabinet designs are going to communicate, "We are ultra-modern and chic chic chic!" or "I wanted to recreate my grandma's beautiful country kitchen because all my best memories are there." 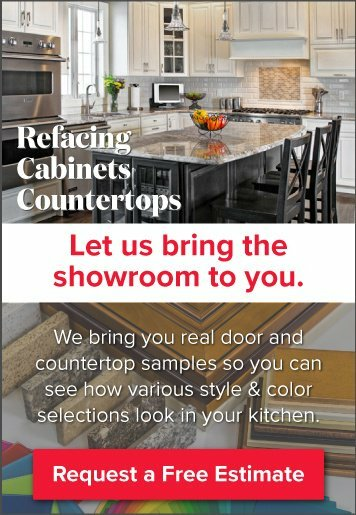 Need some inspiration selecting kitchen cabinet colors or kitchen cabinet styles? 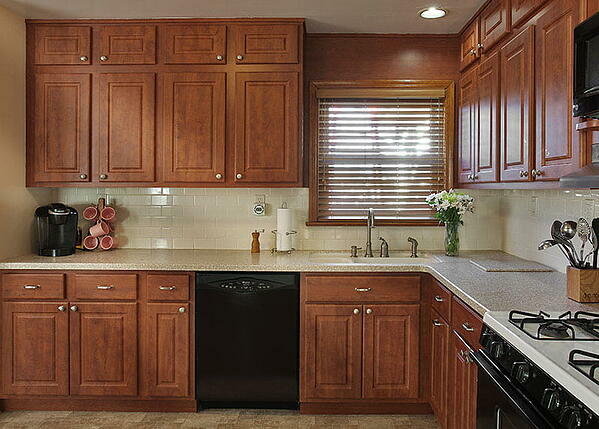 Check out, Our 5 Most Popular Kitchen Cabinet Colors and Our Top 5 Kitchen Cabinet Door Styles. The following are the most popular examples of color and style combinations from real Kitchen Magic kitchens. We're starting from the bottom and working our way up to Numero Uno. You get a bonus here since our Prestige Statesman doors in Suede Gray are almost as popular as the #5 placeholder. Gray is a versatile color and a timeless one as well. This kitchen is a prime example of a contemporary kitchen design—right in the middle between transitional and post-modern with its completely neutral color scheme. Many design magazines and blogs will strongly contend that contemporary styles have overtaken traditional ones these days. And, they're right in terms of what's trendy, but completely flat-panel doors can be a bit extreme for those who aren’t the most modern- and post-modern of home design enthusiasts. The fact of the mater is that our clients continue to vote for the classic look of raised panel cabinet doors, and they come in at number 5 with a deep dark mahogany finish. 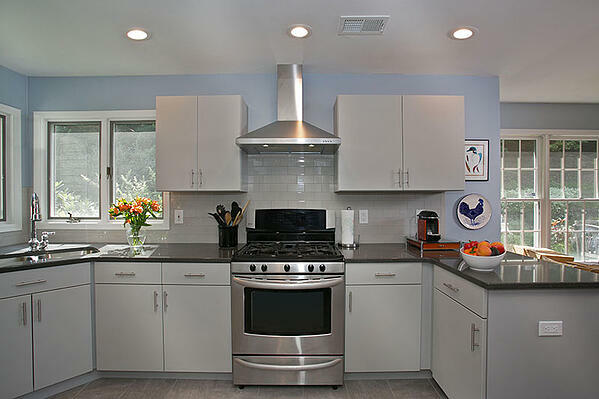 In this kitchen, we installed Vintage Raised Panel doors in our Tropical Mahogany maintenance-free laminate finish. The raised panels provide enough detail to add dimension, but they aren't as ornate as some of the more detailed raised-panel options, allowing them to serve as a transitional solution (and an easier-to-clean option as well). 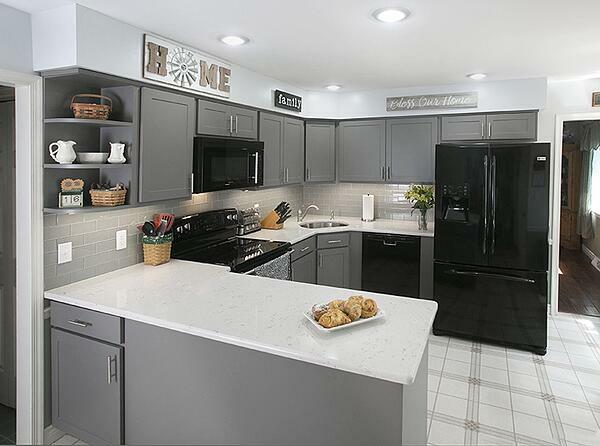 Notice how the countertops have plenty of those rich, dark accents inherent in the cabinetry and black appliance trim, but all within a lighter-color foundation—bringing both brightness and contrast to the design. Here's another example of darker cabinetry; only, in this case, the color patterns found naturally in Cherry wood add a golden glow that lightens things up. Again, raised panels make the cut, for their definition and texture. In this case, it's our popular Prestige Square doors, which are more decorative than the simpler, dare we say plainer, Shaker-style doors. However, they are still appropriate in more contemporary, transitional or modern-themed designs. The contrast between darker and lighter wood grains, combined with the red and brown to golden and lighter-grain colors make cherry an easy cabinet finish to pair with countertop selections. For Number 3, we have a tie. Both the Prestige Plain (shown below) and the Prestige Statesman (shaker-style) door are highly-desired contenders. Many homeowners enjoy finishing these contemporary, flat-panel door styles in our Fashion Gray finish. It's a bit on the warmer side of the Gray spectrum, which puts it into the Greige category (a blend of gray and beige tones). The bonus of this ideal, monochromatic cabinet color is that wall colors can evolve over the years—since both warm and cool colors are complimentary. Homeowners then have a foundational design that moves with them through upcoming trend cycles and their changing, personal style preferences. Isn't it interesting that our Number 2 spot is held by an unarguably traditional design? While it's true that contemporary has surpassed traditional in the "polls," the reality is that a beautiful, traditional kitchen design will never be out of style—and that's certainly the case with this kitchen. Beautiful, Breckenridge Square Doors are finished in Antique White. Then a walnut glaze was washed over the top—highlighting the beautiful details and adding a little warmth to the all-white design. 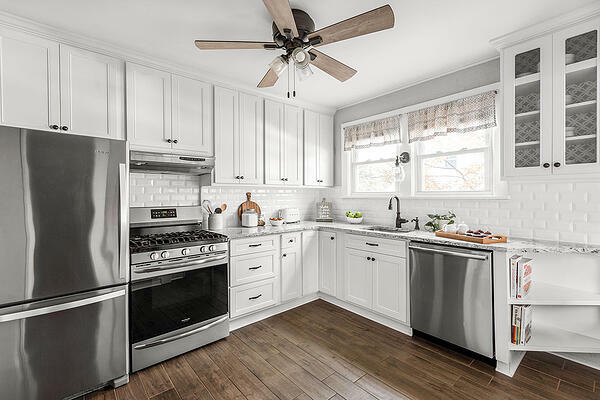 Again, we see how popular the Prestige Square cabinets are; this time finished in Frosty White. This Frosty hue was our most requested white finish, but was quickly followed by beloved Satin White. With the subway tile backsplash, this kitchen can go traditional or transitional with just a few switches of the accents (the hood and plumbing fixtures) and color scheme. 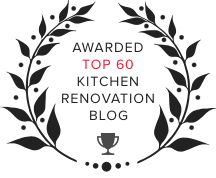 There you have the top 5, well 6 actually, cabinet style and color combinations that our clients have chosen for their kitchens, time and time again. 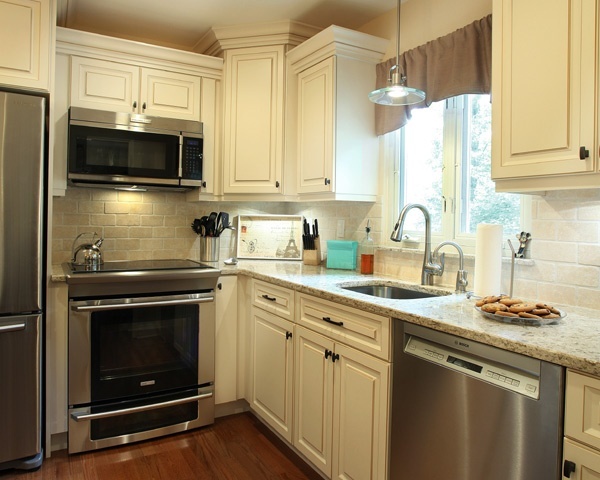 Want some expert advice on choosing the perfect cabinets for your kitchen? Schedule a free in-home design consultation, and we'll gladly provide our expertise whether or not we earn your business. 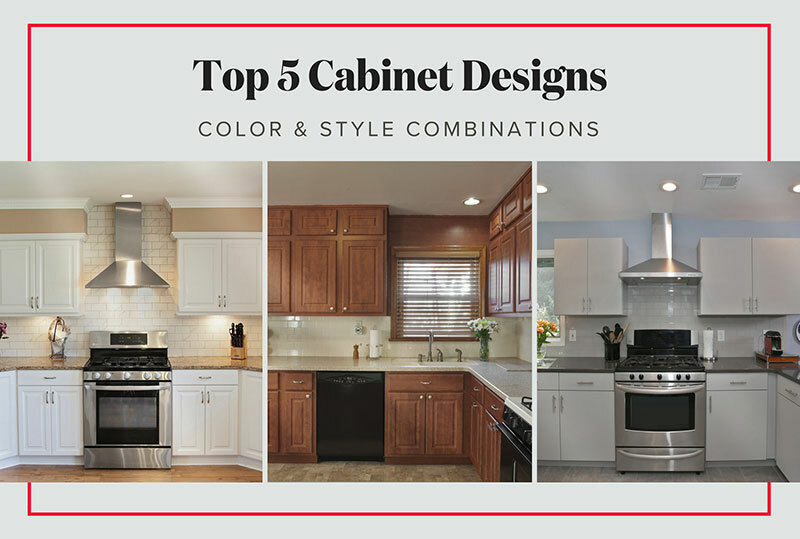 While you're at it, check out this video about our top 5 cabinet colors-only!